The Winter Lick is used to maintain body weight during the dry season by supplementing protein which is deficient in natural grazing, and acting as a ruminant stimulant, which enhances the activities of the rumen bacteria, delivering better utilization of roughage. This is a rain resistant, ready mixed, phosphorus supplement for ruminants on green summerveld. It contains 9% P (phosphate) compared to a traditional 6% Phosphate - salt lick. Summerphos P9 contains a molasses by-product to increase palatability. The content of salt has been reduced to support higher intakes. 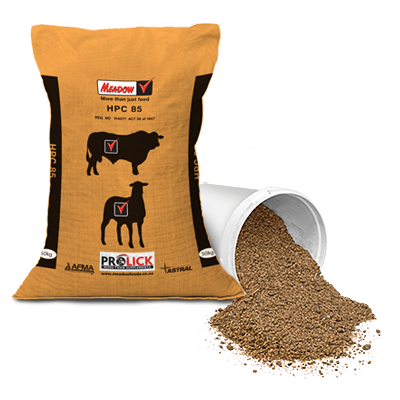 Summerphos P9 contains 16.5% protein which serves as a rumen stimulant and digestion aid. The additional protein prolongs the usage of Summerphos P9 into the dry season as a Transitional Lick. Trace elements that are crucial to enhanced fertility have been added. Elite Sheep 33 Concentrate is a lick concentrate for the home mixing of licks for sheep. Elite Sheep 33 Concentrate has been developed to provide the best possible protein balance in licks for sheep. It contains relatively low levels of urea and high levels of natural proteins. Beef Booster 18 contains high levels of natural protein with by-pass protein. Beef Booster 18 contains Lasalocid which can lead to a 22% gain in growth efficiency on good green veld or pastures. Beef Booster 18 contains Zinc Bacitracin which enhances efficiency of growth. It is very profitable to use Beef Booster 18 on green summerveld combined with a hormonal ear implant. Winterbreker Readymix is used to maintain body weight during the dry season by supplementing protein which is deficient in natural grazing, and acting as a ruminant stimulant, which enhances the activities of the rumen bacteria, delivering better utilization of roughage. Ruminant Block is a Protein, Mineral, Trace mineral Supplement for cattle, sheep and goats on low quality roughage. The product will be used by dairy farmers, cattle farmers and sheep farmers and is specifically handy where all species are found on one farm, grazing the same camps from time to time. Ruminant Block is used to supplement the natural shortage of protein during the dry season. Ruminant Block also provides the necessary minerals and trace minerals, which lead to maximum fertility and reproduction. Adding any product (such as salt) which affects the palatability will decrease the voluntary intake of this product and thus also cause dilution of medicaments and nutrients. Production Lick is the ideal product for the rearing of the breeding herd (Heifers) during the dry season. 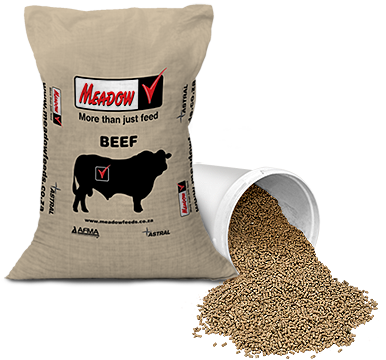 The product contains good quality protein, energy, and trace minerals to achieve optimal growth under limiting grazing circumstances. 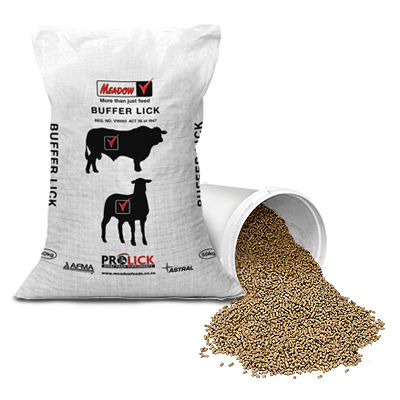 Sheep Lekker Lick Block is a Protein, Mineral, Trace mineral, Energy Supplement to be used before, during and after lambing, and that could be used all year round for wool breeds. Fattening/maintenance of cattle and sheep on crop residues such as maize stover/sorghum stover/wheat stubble, plus grain kernels spilt during harvesting, and the post-harvest residues of soya beans, beans and legume crops, should be encouraged. Maize residue is often available in abundance, but an understanding of its nutritional value and proper supplementation is essential for economic use thereof, either for fattening or maintaining the breeding herd. Ensure that animals are free of parasites. Given the above factors, the risk of urea poisoning is still omnipresent and care should be taken to use licks as prescribed. Limit the intakes of licks to that which is expected. Make sure adequate forage is available at all times and that licks are protected from becoming wet, and the troughs have sufficient drainage. Take note of the transition lick strategy to prevent salt hunger and excessive Winter Lick intake. Do not feed lick concentrates as such (without mixing), but adhere to proper mixing ratios as per instruction on the bag labels. The most common cause of urea poisoning of ruminant livestock is when urea-containing concentrates are fed without mixing.